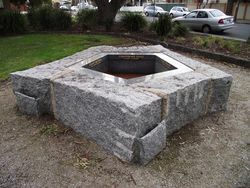 A monument commemorates the five Geelong West Brigade volunteer fire fighters who lost their lives while fighting a bushfire at Linton in 1998. A monument has also been erected at Linton, Victoria. The form of both monuments developed from the desire to equally represent the five Geelong West fire-fighters who lost their lives. Red Calca granite stone at the centre of the monument is representative of the cause they served and the constant reminder to us all of the unpredictability of fire. The water within the fountain cools the stone, symbolic of the rebirth of the bush after fire and a reminder of the principles of everlasting life. On 2 December 1998, a bushfire burned through private land and state forest near the township of Linton, Victoria. Fire fighters from Deptartment of Natural Resources and CFA were deployed to fight the fire. At approximately 8.45 p.m, two CFA tankers and their crews were trapped and engulfed in fire following an unexpected wind change. The crew of one of those trucks, five men from Geelong, all volunteers from the Geelong West Brigade were killed. The coronial inquest examining the fire and the deaths was one of the longest-running inquests in the history of the state. This inquest led to changes in safety operating procedures in the CFA. This memorial is dedicated to these five Geelong West volunteer fire fighters. Geelong fire crews, including volunteer fire fighters from the Geelong West Fire Brigade travelled to Linton to assist in fighting the fire arrivinf soon after 5.30 p.m. that day. At about 8.45 pm a strong wind change arrived. The fire flared up and surrounded the Geelong West truck. The crew members lost their lives in the fire.